Dive Odyssey is a tribute to loved hobbies, diving and sci-fi movies. But what is the common nominator between these two things justifying this project? For me, the connection has always been evident. Cave dive is a visual experience in three dimensions, a flight into the inner space. From my childhood, I remember all the weekends at my grandparents' house, far in the countryside. Along with fishing and carpentry, I got to watch movies on television in the evening, something I wasn't allowed to do at home. One particular time was when I was 8 years old and saw Space Odyssey 2001 for the first time, grandpa dozing off in the chair next to me. I didn't understand much about the movie, but I watched hypnotized all the same. The challenging and open-ended climax wouldn't escape my mind for a long time. The strength of the science-fiction genre is in the ability to address challenging social or personal problems without restrictions. At best, the utopias or dystopias create a shell inside which it is easy to focus on the underlying subject - without the usual constraints set by the real world. In addition to Space Odyssey 2001, other movie classics that have greatly influenced me include Solaris, Phase IV, Rollerball, Silent Running, Blade Runner, Alien, Soylent Green, Man Who Felt The Earth, and Zardoz. The project is a confession of love for diving. It has given me so much. Friends. A new direction for my profession as a photographer. Experiences that no other person has seen or experienced before me. Lost wrecks. Natural cave after thousands of years in the making. Sights underground lit and photographed in a way that no one before me has been capable of. At first, diving in caves wasn't something I was looking forward to doing. I enjoyed the countless details of wrecks. In comparison, diving inside the dark and cold stone didn't seem very inspiring. But all that changed in an instant when I first dived into the Ojamo limestone mine. The surface water was murky, but when going inside, the water turned crystal clear. After a few fin strokes, I entered the K-5 mining hall which is big enough to hold a 10-story building inside it. In the middle of the hall, I could no longer see the walls, the ceiling, or the bottom. I felt like flying in space. I had to use all the power of will to move forward. It all seemed so alien and intangible. It was like stepping out of a spaceship and taking a spacewalk. There was no turning back. I wanted to go deeper and further. Sharing these experiences has been the primary driver in all my diving related film productions. In media, cave diving is often presented as a hobby for people with a sure death wish. It is also seen as an extreme sport that is run by a small group of enthusiasts. The public interest is mainly taken in situations where lives are lost. This is personally experienced when working in the Diving into the Unknown film project. Dive Odyssey tries to show the other side of the sport, the beauty, and space-like environment and experience. The movie has been filmed in three locations. Ojamo mine in Lohja Finland. Mäkelänrinne Swimming Hall in Helsinki Finland. Plura cave and Plura area Highlands in Northern Norway. The cameras used in the project are Sony A7s2, Sony F5 and DJI Phantom 3 Pro in 4K format. Janne is a Helsinki-based freelance photographer and film maker. He graduated from the Lahti Design Institute and specializes in underwater filming. Janne is perfectionist and occasionally impatient commander. In order to achieve the goals, he pushes the team to its’ extreme. As Janne is the camera operator he plans the shoots and leads the team during the under water filming. His enthusiasm strengthens the bond among the others. He is Co-founder of the Divers of the Dark dive team and Co-author of 'Divers of the Dark' book. Janne is responsible of photography and video for all the Divers of the Dark team movies, commercials, books, and magazine articles. Gemma started diving in 2007 and has been diving professionally for almost a decade. She has logged over 2000 dives in caves and open water, using both open and closed circuit equipment. She is now an Ambassador for PADI, specifically promoting women in diving, as well as archeological diving. In the past few years she has specialised in cave diving and in 2016 became one of the youngest ever Full Cave Instructors through IANTD. Gemma has trained extensively in Diving related first aid qualifying as a First Person On Scene (FPOS), HSE First Aid At Work and Diver Medical Technician (DMT). She has written extensively for various national and international magazines and online blogs about her experiences in diving, as well as being an award winning underwater photographer. Throughout the last several years Gemma has been a team diver and team medic working on joint projects between WHOI, Lund University, and the Greek Ephorate of Antiquities on projects including the Mentor Wreck in Kythera and the Antikythera Mechanism wreck in Antikythera. She has recently been involved with working with the Defence POW/MIA Accounting Agency on recovering veterans’ remains underwater from World War 2 wreck sites. As of 2017 she is an associate member of the Woman Divers Hall of Fame. Andy Torbet began diving at age 12 off the coast of North East Scotland. He continued his love of being underwater after he joined the British Army. His 10 year career included commanding the Army’s Underwater Bomb Disposal Team and the High Risk Search Team of the Maritime Counter-Terrorist Unit as well as doing underwater search and recover, reconnaissance and demolitions operations. Since leaving the Army he has forged a living in exploration and adventure media. As well as conducting his own exploration and science projects (with a degree in Zoology, a Masters in Archaeology) he produces films, writes books and magazine articles and gives talks based on his diving, skydiving and climbing adventures. He is also a TV presenter having fronted 21 TV series in the last 7 years for the like of the BBC, Discovery and The History Channel and worked as an underwater stuntman and occasional actor on independent short films. And most importantly he has just finished building his dream home gym. 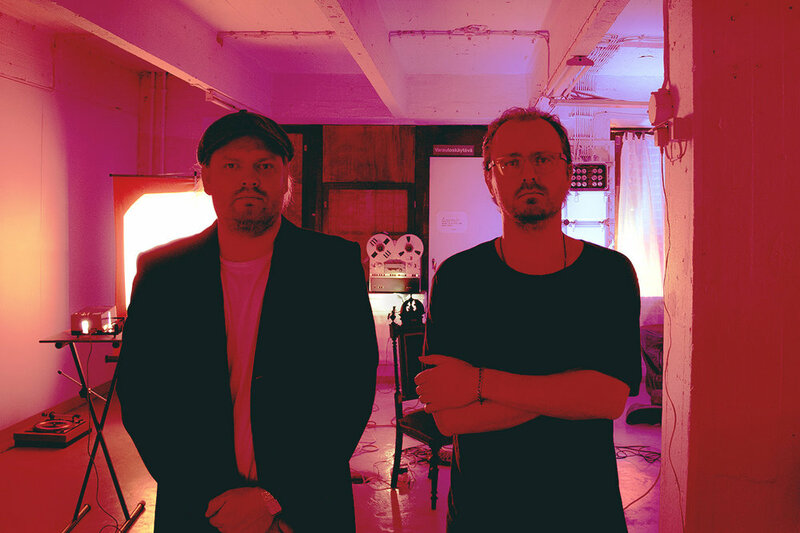 Samu and Ville Kuukka are film composers, sound designers, and recording artists. As the cult band The Gentleman Losers they have released critically acclaimed albums on many labels, including the highly respected Berlin label City Centre Offices. They are signed to another Berlin label, Sinnbus, as part of the indie electronic band Lessons. The brothers' music has been featured in many international productions.